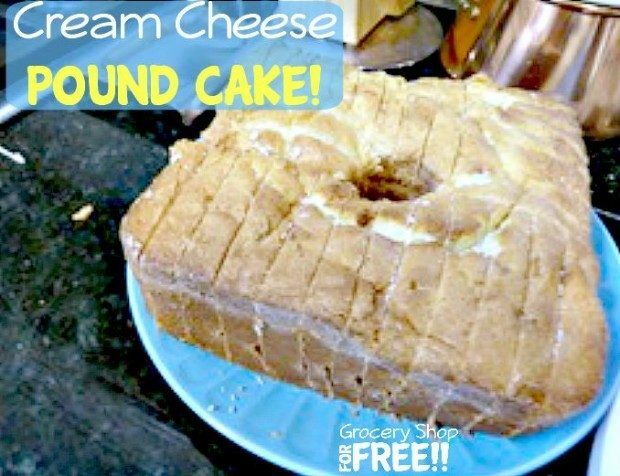 You are here: Home / Recipes / Cake Recipes / Cream Cheese Pound Cake! Susan, from Permanent Posies is back with another great recipe – this time she brings us a Cream Cheese Pound Cake! I went to my daughter’s house this weekend for a party and I offered to take a couple of desserts. I love baking but don’t do it often because my husband doesn’t eat many sweets and I just can’t keep away from them…meaning, I eat it all. So, I almost always offer to bring a dessert to a fellowship or party so that I can get it out of my system. This time I decided to make one of my favorite desserts….a Pound Cake. Now, I have my grandmother’s pound cake recipe and it is an awesome, traditional Pound Cake that I ate at many family gatherings as a kid. I am going to share that recipe with you at another time, however, because this week, I had a hankering (Texas talk for….a strong desire) for a Paula Deen Cream Cheese Pound Cake. So, for all you cooks out there…..what does that mean for us? You got it…..BUTTER! Of course, to be fair to the Queen of Butter, a Pound Cake is named such because the original recipe for one included a pound of flour, butter, sugar and eggs….each. Yikes! That is 10-12 eggs, in case you have never weighed them. Apparently, they used to weigh their ingredients instead of putting them in measuring cups. Who knew? Historians think that the Pound Cake originated in Northern Europe. Then, in the early 20th century, American cookbooks came out with measurements in both cups and weights, helping to bridge the gap. Well, Paula Deen has a Sour Cream Pound Cake, her grandmother’s Traditional Pound Cake….and her famous Cream Cheese Pound Cake. I have some readers from Europe so, just in case you don’t know who Paula Deen is, she owns the restaurant “Lady & Sons” in Savannah, Georgia. She started out making sandwiches and delivering them door to door to various businesses and built that into a enormously successful restaurant. She is quite the cooking show celebrity as well. So here is the recipe for the cake. Grease and flour a 10 inch bundt pan. I have this great square one that was given to me by one of my friend’s mother. I think she has had it most of her adult life and I have never seen another one like it…..so I treasure it. Plus, the center pops right out so….no sticking cake. Cream the butter and cream cheese until well combined. Add the sugar and mix for 7 minutes, until fluffy. Add the eggs, one at a time, beating after each until blended. Gradually add the flour until it is all combined. Add the salt, vanilla and almond extracts. Hit the pan on the counter gently to help settle the batter and remove any air pockets. Bake for 1.5 hours but check it several times for the last 20 minutes so that you don’t overcook it. A toothpick should come out clean. You don’t want to overcook a pound cake because it can sap the moisture right out of it. Remove cooked cake from the oven and wait about 15 minutes before you remove it from the pan. I had to cut it up for the party and forgot to take a photo before. 1. Always cook a pound cake at least one or two days before you want to eat it. The longer it sits there, the better it is. 2. Pound cakes freeze really well. So, make it early….freeze it….and take it out the day before you need it for a party. 3. It is really good kept in the refrigerator. In fact, all cake is good refrigerated. 4. Here is how my husband likes to eat a piece of pound cake. Heated with a tab of butter! Seriously? More butter? I tried it….and though it was awesome, I still like it refrigerated better. 5. You can change the extract from almond to lemon or orange. Did you know that a little almond extract…not too much….makes a white cake…like a wedding cake….taste….like a designer cake. 6. Some of the original recipes included a half a glass of wine or brandy. Not sure what size glass that would be. If this interests you, you might Google it. So, what recipe would you like to share? We would love to try out your recipes, too! Make sure you share with us so we can all try some new things!! Hi! Am a cream cheese eater and this cake recipe makes me wanted to try it but I got confused with the ingredients listed. It says on top 1 tsp vanilla and 1tsp vanilla almond extract but on the directions you only mentioned a vanilla and not vanilla almond extract. My question is are you referring to vanilla AND almond extract (two different) or vanilla almond extract? Thank you and will be waiting for your prompt response. Hi! You add in the Vanilla Almond extract where is says Add the salt, vanilla and almond extracts.